A government order should be issued shortly, BH Anil Kumar, Additional Chief Secretary, Higher Education, confirmed. BENGALURU: Former chief secretary S V Ranganath will chair the panel that will decide the fate of University Visvesvaraya College of Engineering (UVCE) on whether it will remain in Bangalore University’s control or be handed over to Bangalore Central University. “The chairperson will decide on the date of the meeting. There is no deadline. The varsities may have their opinions but the government will take a decision that is in the best interest of the students and faculty. This committee has been formed to give a fair chance to everybody — BU and BCU,” he added. “Committee after committee will be formed but they’re unlikely to touch UVCE under BU till 2022, till the current engineering batch graduates. According to the All India Council for Technical Education handbook, two campuses of a college can exist within a distance of 20km. 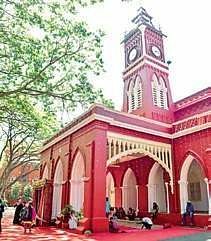 The distance between KR Circle campus and Jnana Bharathi campus is 11.3km, so it’s well within the permitted radius,” a senior BU official said.